I can remember the exact moment that I fell in love with country music. I was in the third grade and it was the last day of school, ie outside picnic day. On this day the whole school is allowed to have an outside playday/picnic. It was so fun! That year someone happened to bring a boombox to school. Towards the end of the day, the song, "Two of a kind, workin on a full house" by Garth Brooks came on the radio. That was it for me. 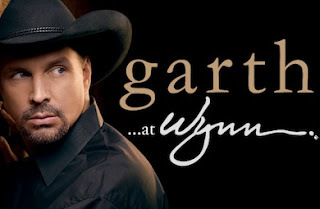 I was forever a fan of country music and I was in love with Garth! In the sixth grade, my dad bought me tickets to go see Garth in Tulsa. My favorite aunt flew all the way from New York to go to the concert with me. I was so excited She was just as excited as I was to see him! His concert was so incredible and full of entertainment. He swung from ropes, smashed guitars, and flung water all over. He sure could put on a show! That concert is the best concert I have ever been too to this day! Before this past weekend that concert was the best concert I have ever been to. Since then I have had many Garth sightings, since we live in the same town and all, seeing him (& Trisha) is not a rarity around here. I have seen him at Casa Bonita, another small restaurant in my hometown, 5K road races, craft shows, and multiple times at the grocery store down the road from my house. While I do not bother him when I see him, as most of us don't around here, I get star struck every single time. It's so cool to see someone that you have idolized since you were nine, it's neat seeing him out and about and supporting the small towns. And best part about it...he seems to be one of the most down-to-earth and genuine guys around and is so polite and friendly all the time. This past weekend Andrew and I were given this awesome invitation by my wonderful friend Alex to go see Garth Brooks in Vegas! His concert at the Wynn Encore Theater in Vegas goes down as one of the top 5 things I will ever get to do or experience in my lifetime. AMAZING! Seriously incredible! Garth puts on a show unlike anything you would ever expect and tells stories like you wouldn't believe. I was in awe from the time he walked on stage until the time the show was over. I had a smile on my face the whole entire time and could not leave the edge of my seat for fear of missing something. I don't think I have ever hooted and hollered so much in my life. His concert was over-the-top. It was unbelievable. So entertaining. Stunning. Incredible. Amazing. Wowzers. Get my drift? Trisha even made a guest appearance & sang 3 songs! How cool was that?!?! One of the best parts about the whole experience, well besides the fact that it is just him and a guitar, no bands or fancy smancy stuff that take away from the artist, is the fact that even though Garth is the number one selling solo artist in U.S. history, he seems so humbled by the love that his fans show him show after show. He loves performing, loves his fans, takes pride in his family, and gives credit to God. What an awesome guy! I am telling you people, this show is a once in a lifetime experience. If you have even the tiniest of all desires to go and see it, by all means, GO!!! Like, I said, it is just Garth and a guitar! And it is in-freakin-credible!!! I can't wait to go back and see him again...right hunny? A special thanks to Alex for this once-in-a-lifetime experience. One that I will never ever forget!